Is Chinese Martial Arts Cinema Underexamined or Undervalued? Stephen Teo's updated academic appraisal of the action genre delivers fascinating historic and cultural context. This volume is part of the series of monographs Traditions In World Cinema presented by the Edinburgh University Press, featuring analysis of “underexamined or undervalued” international film movements or traditions. 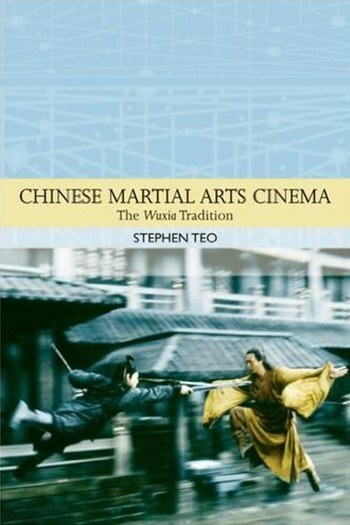 Working from a set format established for the series, author Stephen Teo describes the wuxia genre as a crucial component of Chinese martial arts cinema, with assessments from historic, economic, cultural, and academic viewpoints. Teo, who has authored several books related to this topic, has updated the original 2009 edition with a new chapter on recent developments in Chinese film production. The contextual approach distinguishes this book from most others popularly available. This is an intellectual appreciation, and while specific films, directors and stars are discussed, a big-picture analysis of the wuxia cinema tradition remains the focus. Wuxia refers to a genre of story-telling, usually set in historic dynasties, which involves chivalrous knights-errant who right wrongs and assist the harmonious living of the common people. A wuxia tradition extends back centuries in Chinese literature, and its blend of epic heroes and fantastical-supernatural elements could be considered tailor made for cinema. Teo reflects on how the wuxia genre in film was initially popular but then effectively banned on the mainland in the late ‘20s / early ‘30s for promoting backwardness and superstition, as ascendant cultural and political currents were more concerned with fashioning a modern “scientific” society. The genre would be rehabilitated decades later to serve what the author identifies as both a nationalist and trans-nationalist function. The popular presentation of the genre was left for many years to film studios and publishers located in Hong Kong and Taiwan. With today’s eyes, these early cinema efforts appear rather stiff and clumsy. What is now considered as the classic era of wuxia films was influenced by a “new school” of wuxia literature, serialized in newspapers beginning in the mid-‘50s. By the mid-‘60s, the Shaw Brothers studio declared that the “artifice and staginess” of previous martial arts films will be replaced by a “new style” defined by the “real action” modern audiences required (i.e., more realistic fighting, as seen in films from Japan). Most fortuitously, as the Shaw Brothers endeavoured to reinvent martial arts cinema, two of the directors assigned to their earliest efforts would prove to be masters of the genre and, more importantly, capable of producing popular entertainments. Both King Hu’s Come Drink With Me (1965) and Zhang Che’s The One-Armed Swordsman (1967) would excel at the box-office, and influence a flood of similar production. Over the next 20 years, Chinese martial arts films achieved an international currency, although poorly understood by many as “kung fu”, a related and often inter-generated genre within the overarching martial arts tradition. Wuxia and kung fu can be both the same and not the same thing. The incredible popularity of Bruce Lee in the early ‘70s was based on films which featured hand-to-hand fighting different from the swordsmen and women of the wuxia tradition, and set in contemporary rather than historic dynastic milieus. But the knight-errant figure could be understood in numerous contexts. Come Drink With Me is discussed as a seminal wuxia film, “an amalgam of new school concepts and old school fantasy”, which incorporates the trend to “realistic” violence (spurting red blood) against a classic setting which includes taverns, imperial courtyards, and remote cabins. The adventurous story, featuring the swordswoman Golden Swallow and a drunken beggar who hides his martial skills, is a superior entertainment due to King Hu’s precise control over his camera and editing. Surprisingly, other than Come Drink With Me, his films can be difficult to find for an English speaking audience. King Hu left Shaw Brothers after that first production, to produce the excellent Dragon Gate Inn (1967) in Taiwan. That his best film, A Touch of Zen (1971), is virtually unavailable today is shocking for such an important world cinema classic, which successfully incorporates spiritual concepts through mise-en-scène in a way few films have ever managed. King Hu’s expressive control over his medium marks him as one of the most underrated (if not unknown) major directors in cinema history. Where King Hu made a relative handful of films, the genre’s other great figure of the classic era Zhang Che (often known to Western audiences as Chang Cheh), was incredibly prolific, responsible for literally dozens of films. His career in the genre spanned from one of the first Shaw Productions (Tiger Boy 1965), through epic historical action (The Heroic Ones 1970), Shaolin Temple adventures (Five Shaolin Masters 1975), and the amazing Venoms series from the late ‘70s into the '80s. Over the top bloody violence was a frequent staple of his films, as was a penchant for outlandish costumes and a focus on male bonding and concepts of masculinity. The centrality of fighting in these films, featuring varying degrees of spurting blood and severed limbs, attracts and repels audiences. Teo emphasizes the performative aspects of these presentations, and similarity to the cinema genre of the musical, as set piece sequences are interspersed through the narrative. That is, the violence is not a literal expression of harm but an expressive performance more akin to dance. The success of Crouching Tiger, Hidden Dragon (2000) is discussed as a more contemporary turning point for the genre. The film, an international effort produced on the mainland, is unabashed in its homage to productions of the new school of the '60s, particularly those of King Hu. The female knight-errant, a traditional staple of wuxia, appeared as something new after some decades of the masculine hero as centralized by Zhang Che. The world-wide box office success of the film ensured a new cycle of wuxia productions, only this time back on the mainland of China, the “natural home” of the genre. The previous ban for feudal thinking has been supplanted by a promotion of these films for their popular appeal, serving as expression of a Chinese national identity and purpose as a trans-national product. Since 2000, the trend has been the production of daipan (translated as “big film”), blockbuster films of scale and budget such as Hero (2003), Red Cliff (2009), and The Grandmaster (2013). These films are produced for both the international market as well as the domestic, of which it is predicted that China will be the largest film market in the world by decade’s end. Is Chinese martial arts cinema underexamined or undervalued? The subjective delights of the genre may always relegate it as a cult taste, despite insanely entertaining classics like Crippled Avengers (1978) or 8 Diagram Pole Fighter (1983), as opposed to the ubiquitous forgettable badly-dubbed VHS products that may first come to mind, but landmark wuxia productions of the new school era deserve to be wider known and available. The kinetic expression is unmatched in other world cinema traditions. As predecessors to the current confident blockbuster productions, their relevance to contemporary cinema is obvious. For keeping it all in focus, there is much to appreciate about this book.